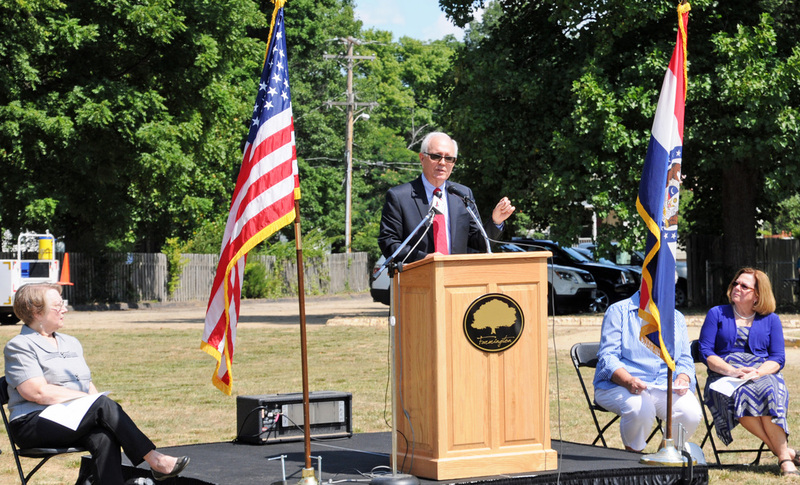 Mayor Stuart "Mit" Landrum noted that construction of a new library had been a long-time goal of the City Council. Also seen are Library Advisory Board President Nancy Bullis (left), Ward II Councilwoman Lynn Crites (behind flag) and Librarian Karen Roman. Librarian Roman presents the Memorial Shovel to the City. Former Librarian and Councilwoman Lynn Crites began talking about the need for a larger library some years ago. 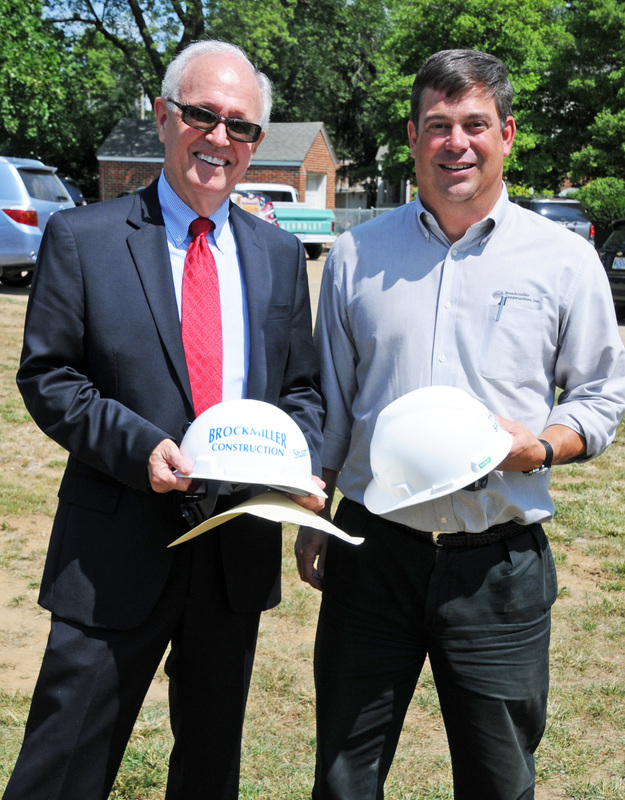 Mayor "Mit" Landrum (left) and Paul Brockmiller, whose construction firm will build the library, were both pleased with the enthusiastic crowd at the ceremony. Mark Totti of station KREI was visibly excited by the large turnout for the ceremony. 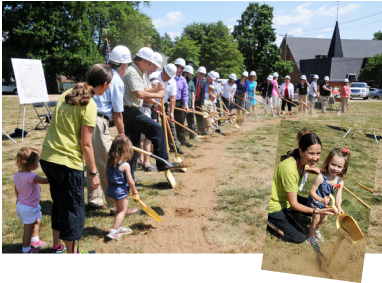 July 29 - The official groundbreaking ceremony was held today for the new Farmington Library building at the corner of Liberty and A streets. Nancy Bullis, President of the Library Advisory Board, welcomed a nice turnout of citizens to the event followed by a public commendation to both the past and present library staff members for their many hours of work. She also offered a big “Thank You” to Parkland Hospital and its parent company for their generous donation of land for the project. Bullis reminded the crowd that the new library would not have been possible without the support of Farmington citizens who voted last spring to provide funds for the new building. Mayor Mit Landrum took the podium and noted that he saw many faces of people in the crowd who have waited many years for this groundbreaking event. Landrum added, “I look forward to when we all gather back here to tour the finished library when we open it.” Members of the City Council, Library Board and Library Staff then manned shovels and officially broke ground for the project on which Brockmiller Construction Company will begin excavation work tomorrow. 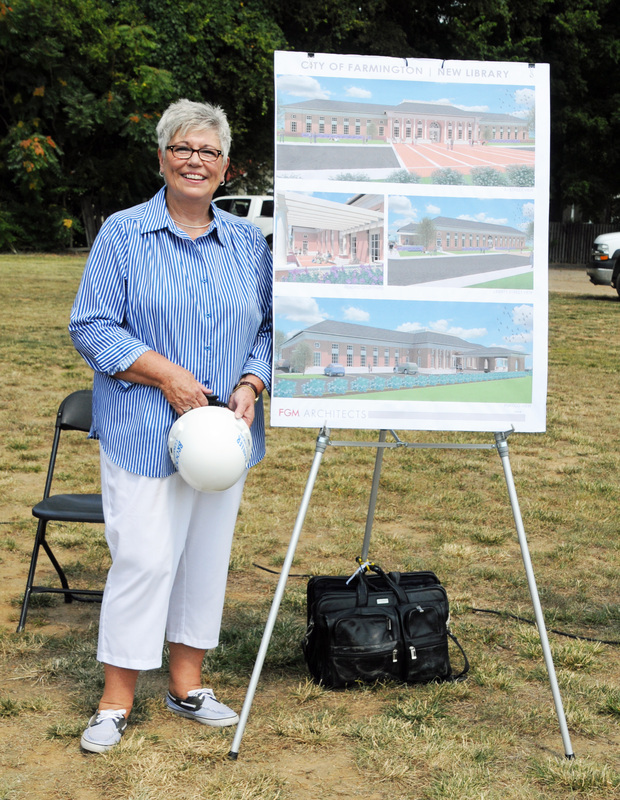 Former Librarian, Lynn Crites remarked that the construction of a larger library was a dream come true. The ceremony ended with a presentation by Librarian Karen Roman of a memorial shovel to the city for display.